While ordinary ladders can get you to the loft of your building, attic ladders have more significant benefits than them. Why? You are going to learn more about them as you search for the best one that meets your needs. Attic ladders can be used regularly especially when you decide to convert your attic into storage or living space. This saves more time than looking for a portable ladder and trying to position them. A good attic ladder is safe to use, durable, easy to extend and saves storage space when folded. Most of these ladders are adjustable to various heights. Let’s discuss more Attic Ladders before you contact your best seller. No more struggle to access your loft or attic! 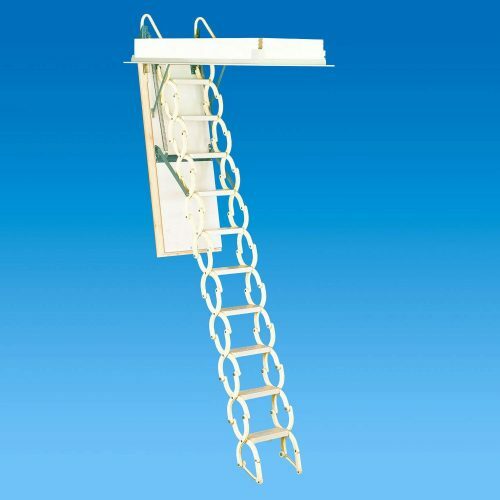 With this attic ladder, you will easily use it and return it when you are through. It has automatic retraction and extension which makes it easy to store on the loft door. You can also use it during construction in your home. When it comes to design, this ladder is styled with safety in mind. In order to remain intact with the substrate, it has non-sleep feet and strengthened by oval tubes. 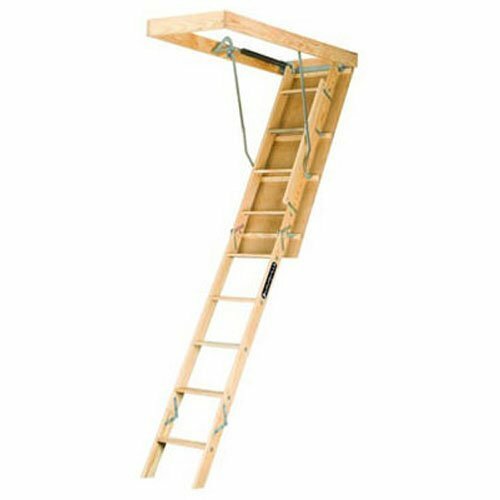 If you are looking for extra space for tools or equipment storage, you should not hesitate to buy this Louisville Attic ladder. This ladder with model number AA2210 has features that surpass the traditional make, and it is user-friendly. Its design is incredible as it allows full clearance to access the storage easily. Unlike the traditional spring usage, this ladder model makes use of a gas cylinder. You can, therefore, move large boxes as it creates a large clearance space. This design also favors the closing and opening of the door since with the cylinders it is very smooth. Safety guaranteed; the hinges are heavy-duty, and hence the ladder cannot wobble. 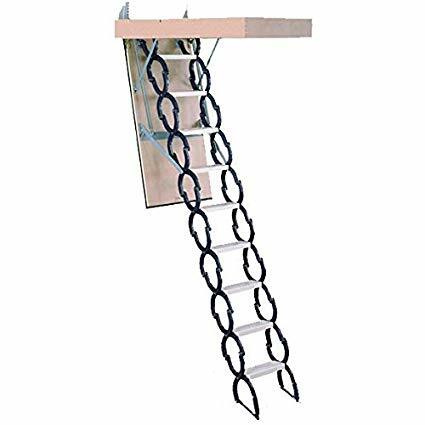 This attic ladder will never disappoint since it reaches most ceilings in various homes. It is also easy to store as it flashes well with the loft area. It is designed well to satisfy all your needs. The design ensures the ladder serves its purpose efficiently and it lasts longer. Using aluminum makes it light and durable. This ladder is designed to reach relatively higher ceilings and provides strong support at the bottom. Rough opening dimensions are 22-1/2 I x 54 Inches. Do you want to save money and space for staircase installation? Here is a solution, FAKRO LST insulated Steel Scissor Attic Ladder. It can offer maximum comfort and ease of use while meeting all the safety and technical needs. This is one of the attic ladders with the most astounding designs. You have to be thankful for the extraordinary folding system that makes it possess small dimensions. You can, therefore, install the ladder in openings that appear small. Its strings have an ‘S’ design which not only makes it attractive but also act as a handrail. It can support capacity of up to 300 pounds. Maybe you have ever used attic ladders which makes you struggle to access your storage. It is inarguably one of the most irritating experiences. With this ladder, you are assured of comfort and safety due to its design and quality. The overall design of this attic ladder is beautiful with rugged stairs and twisted handrails. Its folding stairs will give you pleasure to use. So that you can reach your desired height, you will use a hook and other extra treads provided to you as a package. A pole and an insulated door with melamine finish are also part of the package. It has a weather stripping. 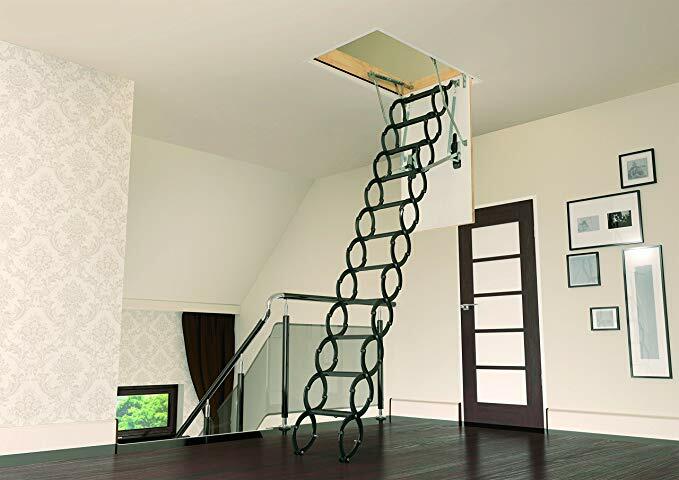 If you are a big kind of guy, you should comfortably go for this attic ladder. It is strong and quick to install. When it comes to its design, it has a double steel ‘scissor’ pattern which makes it beautiful. It has been engineered with both efficiency and safety in mind. This one too comes with accessories needed. White steel scissor with powder coating. No one would be pleased by attic ladders which do not conserve heat energy and those that do not flash well when folded. That is why this Rainbow Prestige offers you the best features you can ever imagine. The design is rugged beautifully with a ‘scissor’ action of double steel. It is made to keep you safe and manage your energy efficiently. The stairs are easy to use and maximize the level of comfort. Powder coating of color blue to the steel scissor. 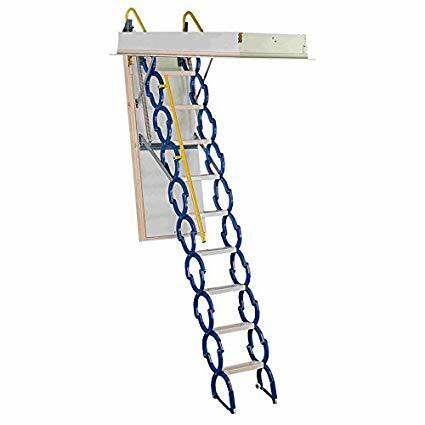 The reason why this ladder stands out from many attic ladders is that it installs into small openings to reach your storage area if it is untapped. You can use it for your closet, hallway or other spaces that are tight. The design allows you to access small openings effortlessly. Thanks to its telescopic engineering. Although the door is not included during the purchase, the door hardware is included. It has a ceiling height from 7’ to 9’10”. This attic ladder is worth spending on. It is pre-assembled, and therefore you will only install it. After that, you can enjoy struggle-free access to your storage space or attics. It has a simple design which ensures it is more sturdy and effective. To avoid springiness and sagging on the ceiling, its design uses counterbalance mechanism. You can paint its high-quality door too. Its door’s material is plywood to avoid heat loss. 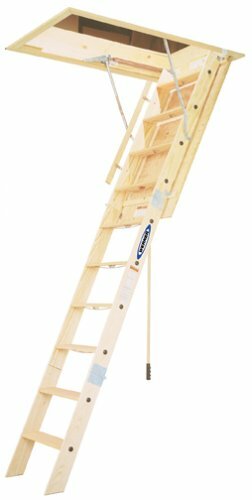 When you purchase this attic ladder, a push/pull rod will be in the package. Plate hinges are heavy duty and therefore remains rigid. You can always trust attic ladders that fulfill ANSI OSHA safety standards, and this Louisville ladder is one of them. It is constructed to give you undisturbed reach to your storage area garage or ceiling compartment. The design focused on saving your time and energy when installing it. It contains supportive EZ hang straps for quick installation. It is easy to make it sturdy when using it and when closed it fits perfectly. Sturdy with a weighing capacity of 250 pounds. 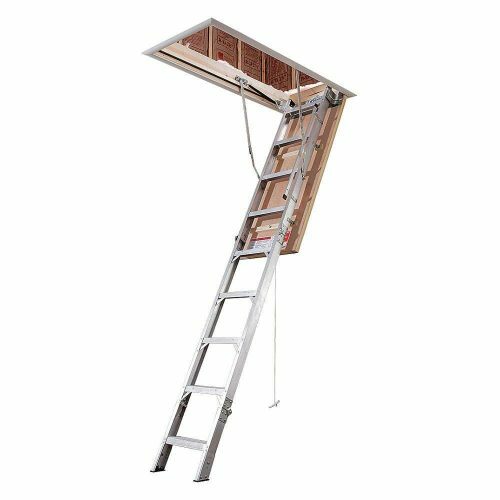 As seen in this attic ladders review, the safety of use is a factor to consider. The ladders are sturdy and the manufacturer use durable materials. It is also good to determine the type of doors you need for heat retention. Look at other features such as the ceiling height and its ability to install in small openings if they matter to you. They are effortless to install using instructions given by their manufacturers. Attic ladders are a quick and easy access path to your ceiling compartment. They are certainly beneficial as new designs and models join the market.